It is much more than that. The Cafe Hollander is located in the quaint and storied commercial area of Wauwatosa that we like to call “Tosa Time Square.” This restaurant-rich region, located at the intersection of State Street and Menomonee River Parkway, has been the source of many happy, high times for this reporter – and has provided a few dips and disappointments as well. Ristorante Bartolotta, directly across the street, is the happy anchor of the square. A long history of memorable meals, wines and events will keep us returning here regardless of the neighbors. Over the walking bridge to the south is Firefly, a sad shadow of the once brilliant Bjonda, a restaurant/lounge that may have aimed too high for the neighborhood. It now aims considerably lower, cloaking its former elegance in the trappings of a sports bar, with a hideous exterior banner announcing it as “an Urban Bar & Grill” where “Kids Eat Free.” There’s the Chancery just to the east, which has occasionally provided badly needed late-night food and beverage, and a Noodles to the north, which hasn’t. 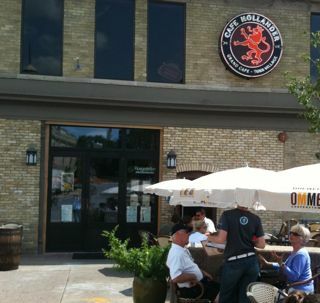 The Café Hollander Tosa Village brings a considerable boost to the area, boasting the same warm, casual atmosphere and excellent imported beer selection that makes its Milwaukee Downer Avenue location a pleasure to frequent. After several visits, including Friday Happy Hours and a Sunday Brunch, we can declare one more great reason to make a regular trek from Mequon – or anywhere in Metro Milwaukee – to Tosa Time Square. The beer list is extensive, with fresh, distinctive imports served carefully at the right temperature in the right glass to satisfy diverse and choosy palettes. A healthy selection of well-made cocktails that go down easy as a Sunday morning. The Milwaukeean features locally made Rehorst Vodka, cheese and bacon – say no more. The best of our party’s selection: Florentine Benedict stacked egg and Hollanaise upon a perfectly cooked bed of spinach and an English muffin as well toasted as I was. The Veggie Omelet seems to have been made with the mistaken assumption that veggies should outweigh egg 3:1. The Benelux Pancakes were pancakes. Thin and adequate with no discernible personality. Brunch service to a large, bustling, hungry, thirsty, indoor/outdoor crowd was admirable and personable. Happy Hour service has been a bit spotty – one young fellow particularly short of memory and slow of foot compensated with sincere embarrassment and dramatic apologies. The pouring, however, has always been as clean, crisp and precise as a hospital corner. By showing such respect for their beer, they have earned mine. One need not be too concerned about attire – the crowd is classic Tosa, including a smattering of business casual, a few trend-conscious hipsters, a lot of cargo shortsters and family scramblers, and the essential percentage of bizarre Milwaukee jawdroppers that make people-watching so rewarding. Relax and come as you are – and try not to be such a judgmental snob! In TMN’s unique 20-star rating system, Café Hollander Tosa Village receives 14 1/2 stars. Previous articleTMN Scores Exclusive, One-Sided Interview with the Back of Robert Duvall’s Head!